Founded in 2002, Owl Moon Raptor Center is a state and federally licensed wildlife rehabilitation center specializing in birds of prey. We have been a licensed non-profit organization since 2014. Owl Moon is located in Boyds, Maryland at the home of its primary operator, Suzanne Shoemaker, and serves Montgomery and neighboring counties. Owl Moon cooperates with the Maryland Department of Natural Resources, Wildlife & Heritage Service, and local animal control offices and humane societies to answer calls concerning injured, orphaned, or otherwise jeopardized birds of prey. Owl Moon rescues, rehabilitates, and reconditions raptors with the goal of returning them to the wild. 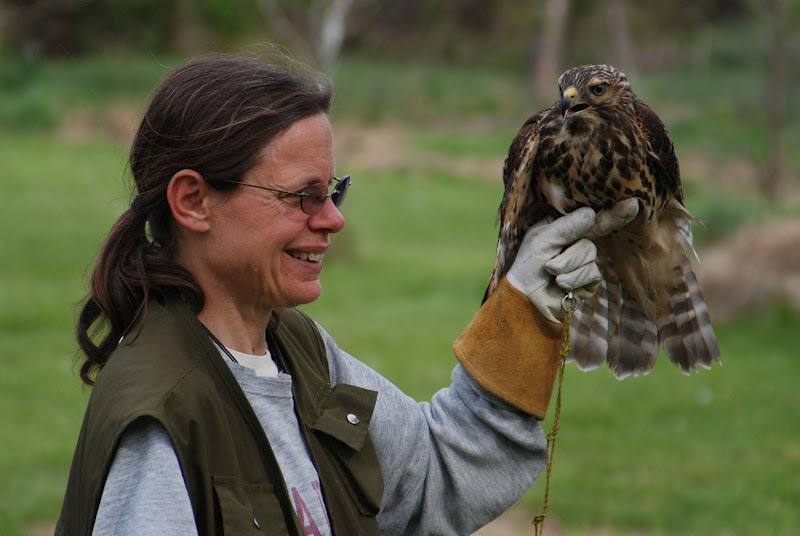 Suzanne is a licensed Master Wildlife Rehabilitator (MD and USFWS), licensed Falconer (MD and USFWS), and current president of the Maryland Wildlife Rehabilitators Association. She trained first as an Animal Scientist (AAS, University of New Hampshire 1975), and then as a Wildlife Biologist (BS, University of Massachusetts 1981, MS, Oregon State University 1986), and more recently as a Wildlife Rehabilitator (2002), Suzanne is an expert in animal behavior, ecology, and the adaptations of animals to their natural environment. Suzanne became involved in education through the Maryland home learning community. Concerned about the deteriorating health of our environment, she engaged herself and her two (now adult) children in volunteer activities to preserve wildlife and our environment, and began teaching environmental education classes to youth and families. Suzanne has taught nature and science classes for Friends of the National Zoo, Audubon Naturalist Society, Montgomery County Public Schools (MCPS), and independently since 1991. Suzanne and her husband, Jan Lewandrowski, share their home with two Siberian Huskies, Athena and Mako, and whatever birds of prey are currently under her care. Her other hobbies include photography, hiking, horseback riding, whitewater kayaking, and backyard beekeeping.